Embrilliance embroidery software for Mac and PC. » Machine embroidery is good for your health! Machine embroidery is good for your health – and some may even say it can save your life! It’s true – I read it on the internet! Laughter makes the world go round and we all need a bit of humor in our lives. 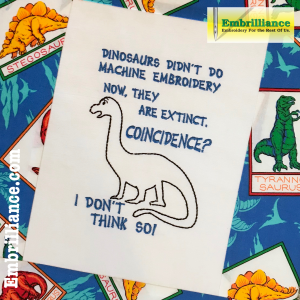 When you find a funny meme or infographic on the internet, it is easy to create a stitched version using a fitting design and the lettering tool in Embrilliance Essentials. Today’s blog post has a link to our free dinosaur design and project instructions. Contained in the zipped file is the dinosaur embroidery design digitized by Lisa Shaw using StitchArtist with lettering objects using one of the built in fonts from Embrilliance Essentials. We have included the BE working file so that you can learn by example! If you have StitchArtist, check out the objects in the dinosaur design to gain digitizing knowledge! Also included in the zipped file is a PDF containing some customizing tips that you may enjoy! The BE working file is exclusive to the Embrilliance platform which will save to all the home formats. If you would like to see how to save your stitch file from the Embrilliance software, check out this video link. Posted 9 months, 1 week ago at 12:57 pm. "I just wanted everyone at Embrillance to know that this program has been absolutely wonderful to work with and I can"t tell you how appreciative I am that you all have designed the program for Mac computers. I have thoroughly enjoyed it"